I just finished reading my last issue of the first volume of Remedy Quarterly, a lovely independent journal of food stories, recipes and home remedies for all manner of ailments, published by STACK magazines. Each volume has a theme (Home, Cravings, Growing Up, & Celebrations) and comes in a different color. With the world of books and journalism speeding headlong toward the digital, it is such a pleasure to receive this magazine in the mail. The “object-ness” of it is so appealing – its 2-color off-set printing gives it an old-school feel – and you can even (gasp) read it on the subway! One of the editors, Kelly Carambula, is the extremely talented graphic designer and author of one of my most favorite blogs, EatMakeRead. If you haven’t already visited, it is a visually stunning site that combines the author’s amazing design skills with her experiments in the kitchen. The last issue, “Celebrations”, featured an interview with Kheedim Oh of Mama O’s Kimchi. It inspired me to get cracking on my own kimchi-making experiment which started with a visit to Kalustyan’s spice shop, which I will write about tomorrow. 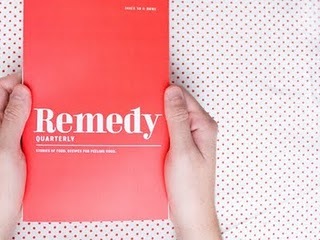 But first I am renewing my subscription to Remedy Quarterly and I urge you to check it out, too! This entry was posted on April 27, 2011, 9:03 am and is filed under inspiration. You can follow any responses to this entry through RSS 2.0. You can leave a response, or trackback from your own site. I hadn’t heard of this magazine before, but I’m definitely going to have to check it out. It looks great!